Somehow a most incredible chef moved next door to my sister in Calgary. Shawna can recall watching episodes of ‘Cook Like A Chef‘, but when Chef Michael Allemeier moved in next door, she never put it together; when she figured it out she was intimidated to cook or bake for Michael. She’s gotten over that because Michael and his family are not above eating Betty Crocker mix cakes (Michael even used her cran-apple jelly for a pop-up dinner event). I got to dine at Casa Allemeier, my favourite restaurant in Calgary, for a record party on a recent trip to visit my sister. I don’t always get to eat next door, but when I know I will, I’ve made it a habit to bring Michael a variety of ingredients from farmers and producers in the Edmonton area; I know he enjoys tasting new products from around Alberta (as well as the challenge of a black box dinner). When we arrived the table was set beautifully and a hand-written menu was laying on the counter. First up was a brightly-coloured sorrel and fennel soup. The Spaniard didn’t know what sorrel was so Meredith took him to the backyard for a look at the hearty herb. Michael mixed the fresca sheep’s cheese that I had brought from The Cheesiry with pine nuts and mint for our next course. 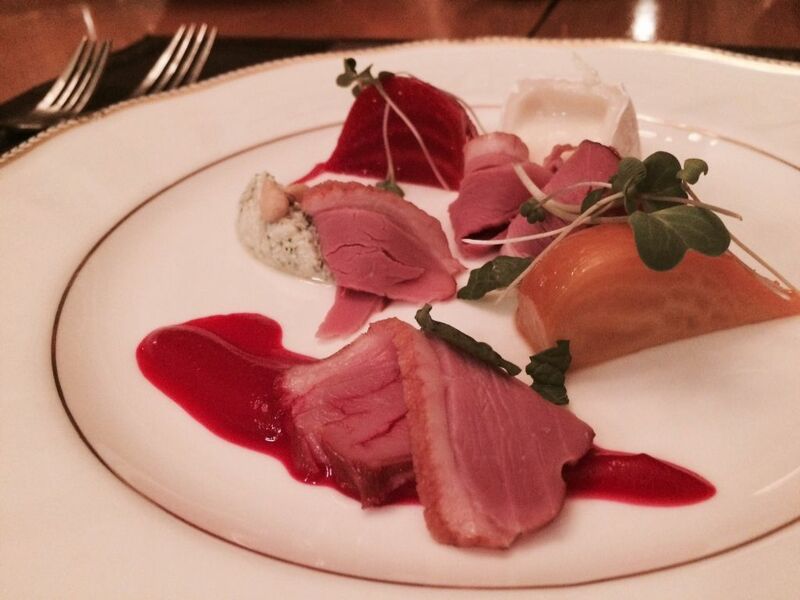 Chef Liana Robberecht helped plate the beets, sheep’s milk cheese, and smoked duck. Chef Liana’s partner in crime, Momo, was particularly fond of the brightly coloured pureed beets. The one responsibility for the guests at any Allemeier record party is to keep the music going; the Spaniard was in heaven with Michael’s collection of albums from the 70’s. Our third course was inspired by a jar of anchovies that The Spaniard brought back from Santander – the salad incorporated The Cheesiry’s pecorino. I had also brought a slab of Irving Farms pork belly for the record party which Michael braised with an assortment of sweet and savoury flavours before finishing off on his BBQ. We left the table to watch Michael plate our next course of grilled wild boar. The meat was paired with an apple gastrique, pomme fondant, and heirloom carrots. Our cheese course of Kootenay Meadows Alpine Cheese and Salt Spring Island Blue Juliette goat cheese was paired with Michael’s pickled cherries and quince jam. To complete our dining experience Michael served a vanilla bean creme brûlée. We were celebrating belated birthdays for Shawna, Michael and the Spaniard, so we had an addition to the Michael’s menu – lemon birthday cake with my niece’s hand-painted sprinkles. While I couldn’t indulge in the gluten-filled cake, the general consensus was that two desserts was much appreciated. A huge thank you to Michael & Meredith for hosting another great record party.